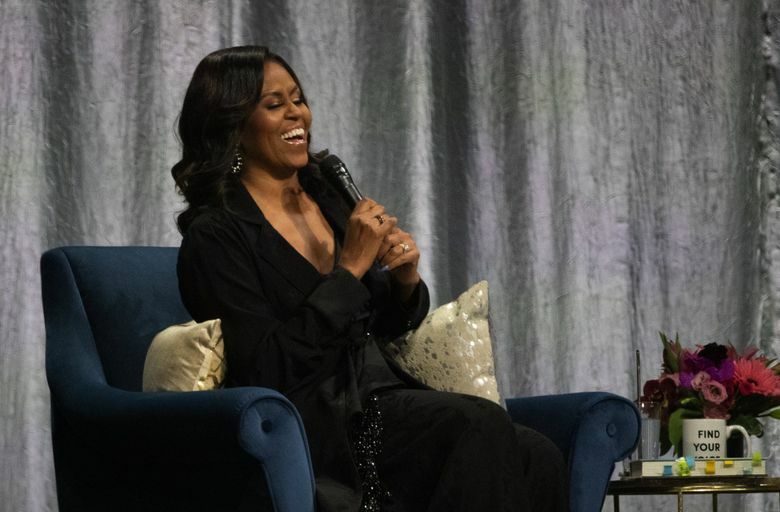 More than 18,000 people filled the Tacoma Dome on Sunday night just to hear Michelle Obama talk about her memoir “Becoming.” The crowd was the largest Obama has attracted in the 21 stops on her book tour to date, and it included many Seattle luminaries. That was the buzz word of the night, as #IAmBecoming started trending on Twitter in the Seattle area. Long lines to enter the Tacoma Dome contributed to the event beginning about 30 minutes later than the 8 p.m. advertised on all publicity materials, but the energy level was high all night. Even before Obama came out on stage, the audience was dancing to the upbeat playlist, posting on social media with the hashtag and cheering to the photos and videos of Obama playing on the big screen. As soon as the lights dimmed, the audience cheered and clapped in anticipation. A select number of individuals came on stage to share who they are “becoming.” Among the speakers were Bird, Ciara, Vedder, a Girl Scout, and Deborah Calhoun, a blue star family member and spouse of an active duty green beret stationed at Joint Base Lewis-McCord. Host Jimmy Kimmel then came out to introduce himself. A video of Obama’s family sharing their memories of her, along with some personal photos and videos followed as the audience got a quick recap of Obama’s life so far. “I see people crying already,” Kimmel said when the video ended. When Obama finally came out around 8:45 p.m. she was given a standing ovation. Here’s a look at sights and sounds from the evening. Were you at the Tacoma Dome to hear the former first lady speak? What was your experience like? Tell us in the comments, below. Here to see @MichelleObama in Tacoma, WA!!! @Ciara presenting and me hanging out with our @WhyNotYouFDN Director Carly!!!! I saw a women wearing a shirt that said "I'm going to drink prosecco and pretend Obama is still president."